Timer with on delay function. Fixed time ranges: 0.1-3sec, 1-30sec, 0.1-3min or 1-30min. The time is adjustable on the timer front. The timer is available in different versions for AC and DC supply voltage. Single or double relay output with LED indication of energized relay. Versions available for DIN rail or 11-pole plug-in mounting. 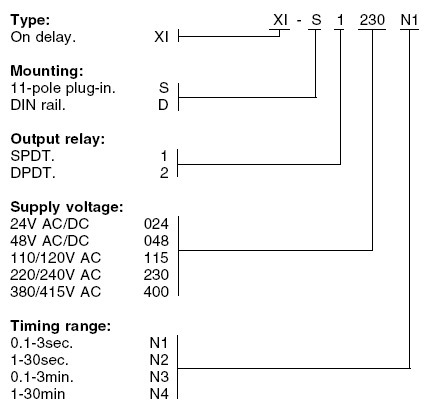 The timing period starts when supply voltage is connected. When the preset time has elapsed, the relay is energized. The relay is deenergized when the supply voltage is disconnected. If the supply voltage is disconnected before the preset time has elapsed, the timer resets. 0.1-3 sec. / 1-30 sec. / 0.1-3 min. / 1-30min. XI-S1 230 N3 On delay relay XI-S1 / 11-pole plug-in / 1 Contact / 195-265VAC / 0.1 - 3min.